Happy the 4th of July 2015! Here comes the 4th of July and JoomlArt would like to wish you all our friends in the United States a Happy Independence Day. We want to send you our little present this day to all JoomlArt.com users. 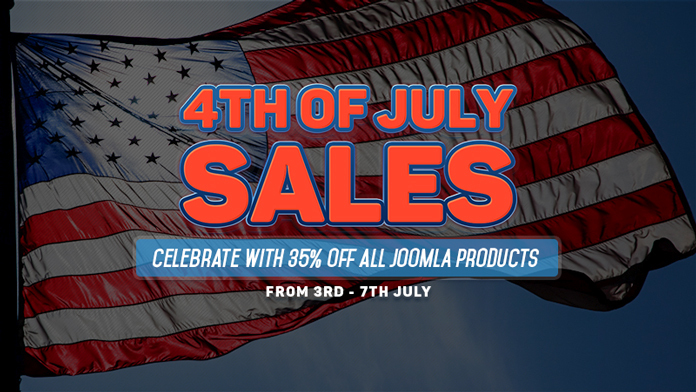 Enjoy 4th of July with JoomlArt special offers! From 3 to 7 July, you can purchase all our Joomla! products at a celebrational price with 35% OFF and additional 15% OFF on renewals. This celebrational coupon is applicable with all new Joomla products purchase! For our current members, the coupon is a 15% on top of the regular 30% OFF renewals, and the coupon for renewals is JOOM47. Please note that the promotion will last through the 7th July. And you only have 4 days (3 - 7 July) to grab this hot offers while enjoying BBQ and fireworks. P/S: Anyone was born on the 4th of July? !